The novelty of his language, his use of metaphor, and his wicked sense of humor. 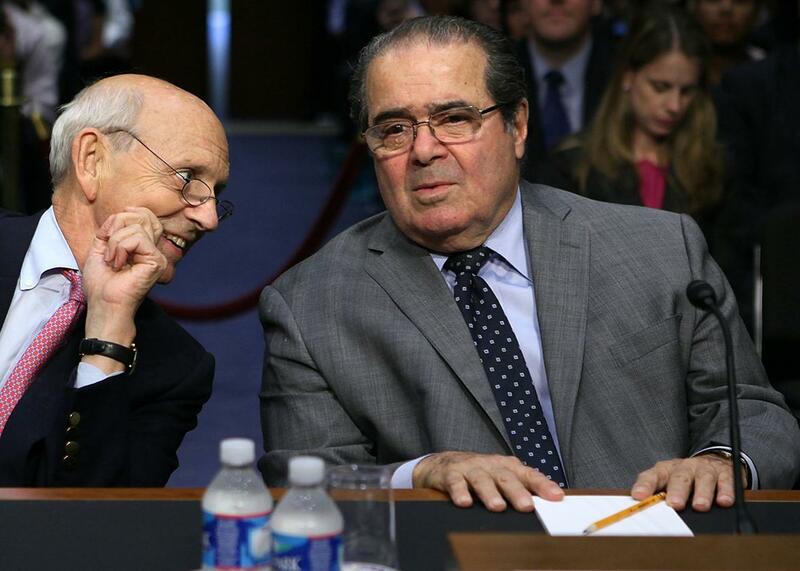 Justices Stephen Breyer (left) and Antonin Scalia testify during a Senate Judiciary Committee hearing in 2011 in Washington. This story is adapted from Yury Kapgan’s article “Of Golf and Ghouls: The Prose Style of Justice Scalia,” which appeared in the Journal of the Legal Writing Institute in 2003. To understand what makes Antonin Scalia’s prose compelling—demanding of attention—we need to understand what makes certain language memorable and others forgettable. First and foremost, Scalia’s use of metaphors deserves attention. Part of what makes his style persuasive, even as criticism, is its novelty. Clichés are the archetypal use of outworn language and the bane of bad legal writing. In the words of one judge, a “cluster [of clichés] robs the opinion of the sudden insight which imparts persuasion.” But even clichés can leave a memorable impression with the reader if they are used in an unexpected way. That is what this suit is about. Power. The allocation of power among Congress, the President, and the courts in such fashion as to preserve the equilibrium the Constitution sought to establish. … Frequently an issue of this sort will come before the Court clad, so to speak, in sheep’s clothing: the potential of the asserted principle to effect important change in the equilibrium of power is not immediately evident, and must be discerned by a careful and perceptive analysis. But this wolf comes as a wolf. The biblical allusion to a wolf in sheep’s clothing is a metaphor that has been used countless times to convey the message that appearances can be deceiving. In this case, however, the metaphor conveys just the opposite: There is no disguise here, no sheep’s clothing, appearances are what they are—clear. Scalia conceded that the kind of issue before the court will often be “clad … in sheep’s clothing.” After the colon he explained that the disruption of equilibrium between the branches of government may not be “immediately evident,” and only through “careful and perceptive analysis” can the wolf be revealed for what it is—effecting an unconstitutional change in the balance of powers. Yet in that lengthy space of prose Scalia deliberately avoided using the term wolf, leading the reader to believe that the metaphor of “sheep’s clothing” was over. So it is with some surprise that the reader stumbles upon the next sentence that clinches the metaphor: “But this wolf comes as a wolf.” Its brevity stands in stark contrast to the immediately preceding sentence: seven syllables in seven words, compared with 79 syllables in 47 words. The last sentence sneaks up on the unsuspecting reader just as the sly wolf catches its prey by surprise. Scalia thus rescued the familiar metaphor from certain death by employing it in an unfamiliar way, and thereby made his substantive point clear. I think the Court errs, in other words, not so much because it mistakes the degree of commingling, but because it fails to recognize that this case is not about commingling, but about the creation of a new Branch altogether, a sort of junior-varsity Congress. The novelty in Scalia’s language is immediately evident: As Charles Fried points out, the Supreme Court has used the term “junior varsity” only once before, in a case involving the real thing. The secret of the Lemon test’s survival, I think, is that it is so easy to kill. It is there to scare us (and our audience) when we wish it to do so, but we can command it to return to the tomb at will. … Such a docile and useful monster is worth keeping around, at least in a somnolent state; one never knows when one might need him. Scalia employed the playful metaphor to compare his colleagues’ application of precedent to a wicked but obedient monster. His critique is of unworkable tests that cater to judicial discretion. But ever the one for drama, Scalia eschewed making that point so bluntly, lest its effect be tempered by its staleness. After all, if one wants to criticize a thing, why not call the thing a ghoul, a creature, or a monster? So Scalia looked for a new way to express a worn point, setting a strange scene indeed: The Lemon test stalks the constitutional landscape of religion, so menacing in its gait that it scares “little children” and “school attorneys” alike. Its perpetual resurrection, despite repeated stabbings through the heart, confirms the unfettered discretion of judges who employ it (“we can command it to return to the tomb at will”). The monster remains entirely at the judges’ mercy. Scalia’s farcical horror story is memorable not for its truth, but for its ability to create a kind of truth out of metaphor. In the words of one commentator, “[Y]ou’ve got to wonder: are little children really frightened of the Lemon test? ‘Mommy, there’s something hiding under my bed—and it has three prongs!’ ” The passage impels the reader to believe the Lemon test is as unworkable as the story he tells is imaginary. Once again, novelty is the hallmark of Scalia’s language: No other reference to a “ghoul” exists in the history of Supreme Court opinions. The monster metaphor in particular catches attention because Scalia seems acutely aware of his audience; in fact, he refers specifically to the court’s “audience.” It is no wonder that humor in a judicial opinion is useful as “a means to make the unfamiliar humane,” in the words of Thomas G. Barnes—especially to an audience for whom legal rhetoric may be unfamiliar. One might say that humanness engenders credibility, and credibility engenders persuasion. Often a judge’s language catches attention simply because of its incongruous placement in a judicial opinion. In his familiar diatribe against the court’s use of amorphous legal tests, Scalia in one opinion accused his brethren of creating “endless, uncertain, case-by-case, balance-all-the-factors-and-who-knows-who-will-win litigation.” The comical effect of this line lies in its elementary-school-like use of hyphens between words that should have a concise substitute. Yet in this case the style can hardly be separated from the substance: Scalia suggested that the court engaged in elementary-school-like reasoning. “the real question is whether a jury can tell the difference—whether Solomon can tell the difference—between municipal-action-not-entirely-independent-because-based-partly-on-agreement-with-private-parties that is lawful and municipal-action-not-entirely-independent-because-based-partly-on-agreement-with-private-parties that is unlawful. Form and substance are intimately connected in these examples. The hyphen-filled adjectival phrase is a peculiar stylistic manifestation of Scalia’s criticism and, often, his substantive philosophy. Scalia employs hyphens to embody the naiveté of the object of his criticism, luring his audience into implicit agreement through oversimplification. Opposing arguments or interpretations are reduced to childish-sounding catch phrases lacking authority. Often the object of his criticism is what he believes to be a group of unelected, life-tenured and therefore unaccountable judges who resolve questions of policy under the guise of legal reasoning. The gaggle of hyphens is precisely the kind of “homely or popular mode of diction” that grabs and amuses the reader largely because of its apparent incongruity. The informality is Scalia’s way of comforting his audience by reminding them of his own humanity, invoking the very same formative thought process that engages his audience—namely, that step between thought and communication. He writes as if he spewed his thoughts onto paper without thinking enough to form the appropriate words. Yet his witticisms are certainly deliberate.